The Rev. Desmond Tutu called Bryan Stevenson, founder of the Equal Justice Initiative, “America’s young Nelson Mandela.” That's the comparison readers may first encounter when they read reviews and articles about this man. Stevenson has won countless awards including a MacArthur Foundation Genius Grant in 1995, has been recognized with honorary degrees, given TED talks, and served as a professor at high profile universities. His Wikipedia biography entry mostly consists of a list of such honors. 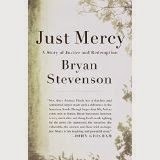 Stevenson’s recent book, Just Mercy: A Story of Justice and Redemption, chronicling his life work barely mentions such hallmarks of societal approval. In their place unobtrusively inserted in the double-stranded threads that propel the non-fiction work are vignettes of chance acquaintances with those who came before – some nameless; one, Rosa Parks, famous, – who simply and quietly showed compassion, mercy or strength as they struggled for civil rights, dignity and mercy for the most downtrodden. The book’s first thread focuses on the story of Walter McMillian, a story that describes the trial, incarceration, liberation and Stevenson’s ensuing life-long friendship with McMillian. McMillian served six years on death row for the murder of a white woman, a murder he didn’t commit. McMillian’s was among the first case Robinson worked on, and became perhaps his most self-defining. The miscarriage of justice, illegal manipulation and withholding of evidence by the prosecution, the Sheriff and others involved was so egregious that it makes for a great story as well as a great victory. It’s so good a story that it has been told before on 60 Minutes (which played a role in McMillian’s freedom) and by investigative journalist Pete Earley in an Edgar-Award winning book, Circumstantial Evidence. Ironically the murder and miscarriage both take place in Monroe County, Alabama, where Monroeville, the town and courthouse made famous by Harper Lee’s To Kill a Mockingbird. The second thread is the founding and growth of the Equal Justice Initiative. That growth includes quick sketches of the crimes, trials and incarceration of minor characters as the work’s subjects expand from those on Death Row, to the wrongly convicted, to children in adult prisons, women in prison, to racial inequality and focusing on the unjust conditions of the past and present. Supporting these stories are significant and appalling statistics explanations about the growth of prisons – some examples will be cited on this blog another day. In a similar vein, Stevenson twice tells of being mistaken for a criminal himself – once by police as he sat in his car listening to music, and another time by a judge and prosecutor in the courtroom where he sat alone preparing. Such anecdotes support the idea that all black men experience discrimination, are treated differently because of their race at some point in their lives. Nearly missing from Stevenson’s tale are details of non-professional adult personal relationships. It seems Stevenson is so single-minded, so committed to his mission, so saintly, that he sacrifices these as well as creature comforts and normal remuneration for his work. Stevenson does, however, give glimpses of being human. We glance at formative childhood experiences – a grandmother who tells him you can’t understand things from a distance, you have to get close; a one mother who scolds and redirects Bryan for laughing at a stuttering child; a grandfather who is murdered by teen thieves. And there is a chapter in which Stevenson questions if the work is worth being around so much anguish and misery. Those who give him the best sense of the worth of his work include the aforementioned Rosa Parks and two of her dearest friends, an old black man on crutches who comes to listen to Stevenson speak – and shows off civil rights battle scars of his own and a woman Stevenson meets in the courtroom. It’s in a final character, this nameless woman who considers it her mission to be in the courtroom for whomever needs someone to lean on that Stevenson meets his match. After explaining her own story, she calls herself a stonecatcher -- one of those who catches stones that others cast at the poor and the powerless. She makes the case that’s what Stevenson does too. While some, like me, may seek Stevenson's measure as a man in a quote comparing him to a national hero, Nelson Mandela, by a noted voice (Desmond Tutu's) for Stevenson, a old black woman who goes to court everyday just to be there for others who suffer seems like the right fit. And that's another measure of this extraordinary man.